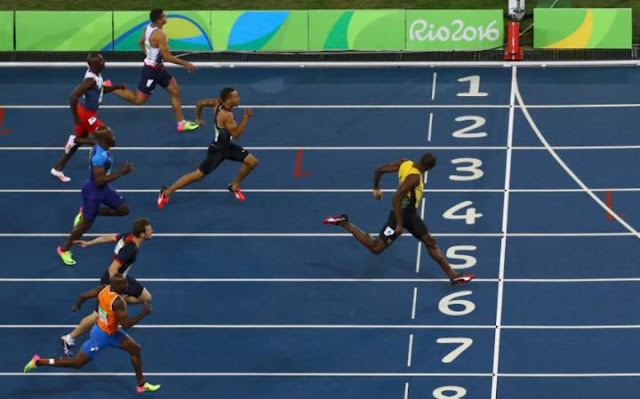 Usain Bolt ran to victory in what he says is his last Olympic 200m race this morning, but finished in 19.78 seconds, more than a half-second short of his own world record — the one he said he really wanted to break. The field running far behind him through the drizzle — Andre de Grasse of Canada finished .24 behind and Christophe Lemaitre of France took bronze — Bolt was giving every ounce of effort, grimacing as he approached the line. He glanced to his left to check out the clock just before he crossed. The time came up, and when Bolt saw it, he tilted his head back and yelled, stuck his hands wide open as if to say "Why?" then tore off the No.6 sticker that was on his right hip. But the after-party was great, as usual. 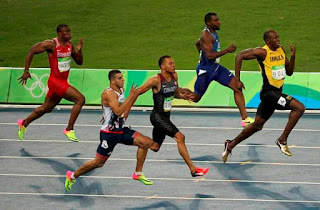 With chants of "Usain Bolt, Usain Bolt" ringing out, Bolt paraded around the track with his flag, reggae music blaring in the background, then dropped to his knees and kissed the track before giving his iconic 'Lightning Bolt' pose. His record in his favourite race still stands, though, at 19.19. He set it in 2009 at the world championships, breaking the mark he'd previously set the year before (19.30) when he made his debut in Beijing. "It's something that you work so hard for, so that when the moment comes, winning is just relief," he told the BBC. "Obviously so much could have gone wrong. So to win today, the feeling is one of relief. "I wasn't happy with the time and my body did not respond to be down the straight. But I'm getting older, so I am pleased to get the gold medal. That is the key thing. "I didn't feel any extra pressure because I don't pay attention to the media before races. I just focus on what I need to do. I came out here and I get the job done." He continued: "I don't know about the 200m in the future. Next year at the World Championships it will likely just be the 100m, even though my coach keeps trying to convince me otherwise. But personally for me, I think this is the last time I will run the 200m." Bolt, at 29 years and 363 days of age, surpassed Michael Johnson, (28 years and 323 days, in 1996) as the oldest gold medallist in this event. De Grasse added a silver medal in the 200m to his bronze in the 100m. It was Canada's first medal in this event since 1928, when Percy Williams won it.